We bring forth a comprehensive range of Iron Curtain Fittings. We take into account the international quality standards set by the industry and fabricate the best quality Iron Curtain Fittings. 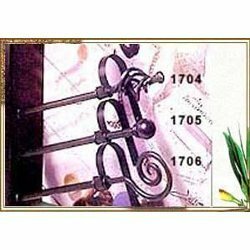 This high grade Iron Curtain Fittings combines aesthetics with optimum utility. Being very easy to use and operate, these consume less space and are available in market in standard sizes. These sets comprise of: 2 finials, 2 brackets, pipes (Ø 16mm-110cm, Ø 19mm-110cm) and hardware packs. These are packed in a way ready to sell in vinyl polybags with headers. Also available in loose packing. Banking on our enriched industry experience, we are engaged in manufacturing and exporting the most sought after range of Brass Products and Metal Ware Products. The huge gamut of products offered by us include Brass Door Handles, Door Handles, Door Knockers, Window Fittings, Curtain Fittings, Curtain Hold Backs, Brass Curtain Fittings, Curtain Finials Fittings, Bathroom Fittings, Drawer Pulls Handles, Garden Furniture, Hearthside Accessories, Railings Brackets, Cabinet Knobs & Handles, Electrical Switch Plates, Casters, Flanges, Plumbing Hardware, Aluminum Fittings, Ironmongery, Sign Boards and France-Interknobs. Being a client centric organization, we try to understand the diverse requirements of our clients and offer suitable range of products. Our business has spread far and wide across the major countries such as U.K., U.S.A., Australia, New Zealand, Germany and U.A.E. We have earned the goodwill and trust of our clients through timely delivery of quality approved range of products.